As late August approaches, zucchini and corn are everywhere. 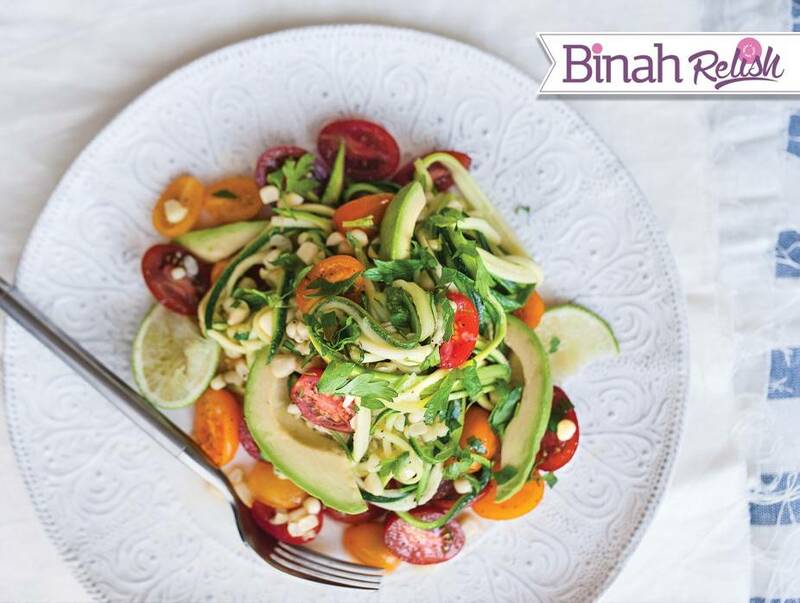 This salad highlights the best of the season, with the zucchini “noodles” slightly cooked, yet still firm, served alongside cherry tomatoes and fresh corn doused in a honey-lime vinaigrette. The harmonious blend of flavors and textures makes a great side dish as well. In a large skillet, heat the olive oil over a medium flame. Add the zucchini and corn and toss to coat in the oil. Continue mixing until the zucchini is just cooked through, approximately one to two minutes. Remove from heat. In a large bowl, combine the vinaigrette ingredients and whisk well. Add the tomatoes, avocado, and zucchini mixture and toss to coat. Serve immediately. This salad should be eaten the same day, since zucchini has a high moisture level and becomes soggy overnight.